Y., Melissa F. (2005) Hubungan antara komunikasi agresif dan persepsi terhadap konflik pada pasangan dewasa muda. Skripsi thesis, universitas Tarumanagara. Aggressive communication in young couples can cause perception of conflict. 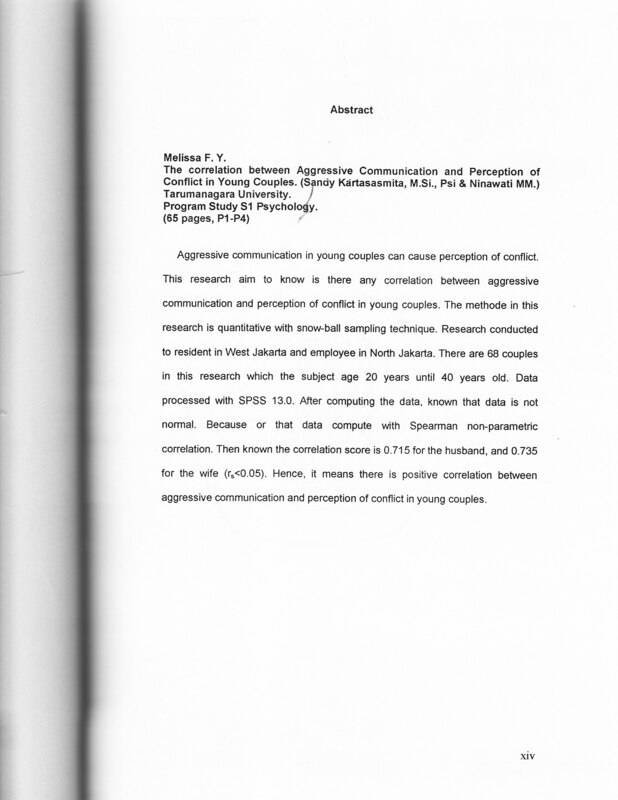 This research aim to know is there any correlation between aggressive communication and perception of conflict in young couples. The methode in this research is quantitative with snow-ball sampling technique. Research conducted to resident in West Jakarta and employee in North Jakarta. There are 68 couples in this research which the subject age 20 years until 40 years old. Data processed with SPSS 13.0. After computing the data, known that data is not normal. Because or that data compute with Spearman non-parametric correlation. Then known the correlation score is 0.715 for the husband, and 0.735 for the wife (rs<0.05). Hence, it means there is positive correlation between aggressive communication and perception of conflict in young couples.